Europe PubMed Central (Europe PMC), the free online database of biomedical research abstracts, has integrated Altmetric badge visualisations to their database. The new integration offers users a colourful, collated record of online mentions, shares and discussions for each individual article. Including the badges enables academics and researchers to click through to see the collated record of attention across a variety of sources including news and social media, public policy documents, post-publication review forums, online reference managers and Wikipedia, with all data updated in real-time. The badges are live now in the ‘External links’ tab of each abstract where users will see the Altmetric ‘donut’ and score. Altmetric’s Founder and CEO Euan Adie noted, ‘The addition of Altmetric badges to Europe PMC allows for immediate insight into the broader activity surrounding content indexed on the platform. Users will be able to clearly see the attention that each article has received amongst a wider audience, and make more informed decisions about their reference material’. The badges are now live and visible on Europe PMC articles that Altmetric has found attention for. Europe PMC is an online database that offers free access to the biomedical research literature. 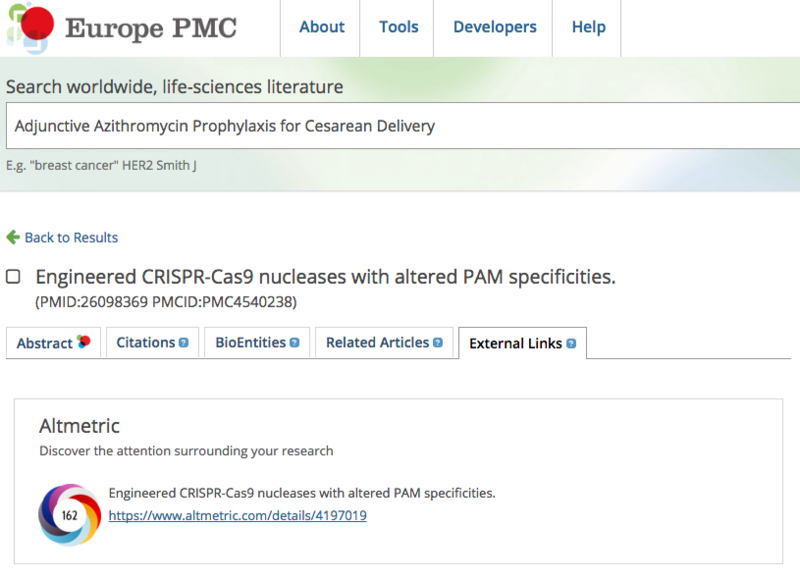 Europe PMC gives users access to both articles and grants as well as powerful search tools, data citation features and much more. For more information please visit the Europe PMC website and the Europe PMC blog. Altmetric was founded in 2011 and has made it a mission to track and analyze the online activity around scholarly literature. Altmetric tracks what people are saying about research outputs online and works with some of the biggest publishers, funders, and institutions around the world to deliver this data in an accessible and reliable format. Altmetric is supported by Digital Science. Visit http://www.altmetric.com for more information, and follow us on Twitter @altmetric. Digital Science is a technology company serving the needs of scientific and research communities at key points along the full cycle of research. It invests in and incubates research software companies that simplify the research cycle, making more time for discovery. Its portfolio companies include a host of leading brands including Altmetric, BioRAFT, Figshare, Labguru, Overleaf, ReadCube, Symplectic, ÜberResearch and TetraScience. It is operated by global media company, the Holtzbrinck Publishing Group. Visit http://www.digital-science.com and follow @digitalsci on Twitter.